We welcome your orders by phone or online. One of our friendly & knowledgeable Team Members look forward to answering any questions you may have, as well as handling your order in an expeditious manner. Call us at 1-719-481-1361 to speak with Gayle or one of her associates at Monumental Miniatures. Our Team Members are available Tuesday – Saturday from 11am – 5pm MT. We gladly accept Visa, Mastercard and Discover. Monumental Miniatures is pleased to accept your personal check; however, payment by check requires a 5-10 day waiting period until the check is cleared. We strive to process and ship all orders for standard product in 1-2 business days. Custom packed dollhouses are shipped in 7-10 business days. Our products are well packaged to withstand damage during shipping. Please note, you will see wear and tear on the carton, this is normal and should be expected due to the weight of our dollhouses. If an item is damaged beyond repair, please notify us immediately but no later than 5 business days from delivery. We will make every effort to resolve the issue. Please call immediately 719-481-1361. UPS Deliveries: Monumental Miniatures requires the customer to note damage upon receipt of the package. You must notify us of all damage claims within 5 business days from delivery. Before you sign for the delivery, carefully inspect the package(s). If it appears to be “box” damage only, keep the package. If the package appears damaged and it looks like contents are missing, please note this information to the driver but keep the package. DO NOT REFUSE THE PACKAGE. UPS only reimburses for damages or loss of contents, not the shipping carton. Notify us immediately at 719-481-1361 to discuss the damage and/or missing pieces and we’ll discuss the course of action that needs to be taken. DO NOT discard any packaging materials. Everything must be kept in order to issue a claim through UPS. Please be advised that failure to contact us promptly after delivery will result in Monumental Miniatures not being able to issue any type of store-credit or exchanges. All damage claims must be reported within 5 business days from delivery in order to initiate a claim (if needed). When you place your order and provide us with your email address, you will automatically receive an email from UPS when your order is shipped. You will be able to track your shipment’s progress through the link provided by UPS. We strive to process and ship all orders for standard product in 1-2 business days. 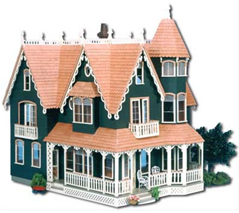 Custom packed dollhouses are shipped in 7-10 business days. If you need to change or cancel your order, please let us know immediately. We will gladly make every effort to process the change/cancellation provided your order has not entered the shipping process. If your order has already been shipped, it will be considered a return and the cost to send it back will be your responsibility. In order to request a cancellation or change to your order, please call 719-481-1361. To ensure timely processing of your change/cancellation, please do not send your request via email. Missing or damaged pieces does not constitute a return. If you have purchased a dollhouse kit and found some pieces missing or damaged, we will be happy to replace them at no cost to you. There is no need to return the kit. In order to ensure you receive the correct piece(s), please quote directly from your instruction parts list the quantity of missing/damaged item(s), the item number and/or name, plus all dimensions and details listed. You can either email the information to Gayle@Monumental Miniatures.com or call us at 719-481-1361. We accept returns within 15 days from the date of delivery. All items must be new, unopened and returned in their original packaging. You MUST receive authorization from us before returning any items. If you fail to receive authorization prior to sending us a return, your store credit/exchange may be delayed. Please email us at Gayle@MonumentalMiniatures.com to receive an RMA#. The RMA# must be written on the box. Please include a copy of the original invoice and the reason for the return. A 20% restocking fee will apply to all products returned. Monumental Miniatures will issue a credit to the credit card used at the time of purchase, less any applicable fees. In the unlikely event that your package is lost in transit, the package and its contents will be replaced by the carrier. Sorry, but no refunds are issued on lost packages. We will replace the lost merchandise and ship the same as the original shipment. In the unlikely event that your package is misdirected while in transit, the original package will be routed to you, the receiver, as quickly as possible by the carrier. No order may be cancelled, refused or returned due to the routing error. A replacement will not be shipped unless we are notified by the carrier that the package is not able to be located. In this instance, it becomes a Lost Package and will be replaced by the carrier. If we shipped you the wrong item(s), please email us at Gayle@MonumentalMiniatures.com or call us at 719-481-1361 to request a UPS Call Tag. We will issue the Call Tag and ship you the correct item at no additional cost to you. Monumental Miniatures is dedicated to bringing you quality items at the best prices, and we stand behind our products 100%. If you are not satisfied with your order, unopened boxes may be returned within 15 days of receipt for an exchange or credit for the cost of the item. All returns must be preauthorized by emailing Gayle@MonumentalMiniatures.com. Shipping costs cannot be reimbursed, so please be aware if you are purchasing a product with “Free Shipping”, the actual shipping costs will be deducted from your return. We do not accept C.O.D. If you have purchased a dollhouse kit and found some pieces missing or damaged, we will be happy to replace those parts at no cost to you. There is no need to return the kit. In order to ensure you receive the correct piece(s), please quote directly from your instruction parts list the quantity of missing/damaged item(s), the item number and/or name, plus all dimensions and details listed. You can either email the information to Gayle@MonumentalMiniatures.com or call us at 719-481-1361. If an item(s) is damaged upon receipt, please keep the merchandise in the packaging it came in and notify Monumental Miniatures for further instructions. We cannot accept returns of “Bargain Basement” or closeout items, shingle dye, catalogs or patterns. Remember: All returns must be preauthorized by emailing Gayle@MonumentalMiniatures.com. Monumental Miniatures dollhouses are not recommended for children under the age of 13. We maintain the data that you provide us, along with a record of your purchases, in a secure database. To best serve you, we may combine this information with data that is publicly available and data that we receive from other reputable sources, including our credit card issuer. We contract with other companies to provide certain services, including credit card processing, shipping, name and address verification, email distribution, market research and promotions management. We provide these companies with only the information they need to perform their services and work closely with them to ensure that your privacy is respected and protected. These companies are prohibited by contract from using this information for their own marketing purposes or from sharing this information with anyone other than Monumental Miniatures. From time to time, we make our mailing list (names and addresses only) and general shopping activity available to reputable companies whose products we believe will be of interest to you and whose privacy practices meet the Direct Marketing Association’s privacy standards. We do not share email addresses for this purpose. If you prefer that we do not share any information with these companies, please contact us. We offer choices about the types of information you receive from us. If you prefer not to receive catalogs or other communications from Monumental Miniatures or if you prefer to receive them less frequently, please contact us at the address shown below. If you no longer wish to receive our Email Newsletter, you may also contact us at the address below or unsubscribe using the link provided in each edition of the email. Please be sure to provide us your exact name and address so that we can be sure to identify you correctly. Because mailings are planned in advance, it may take several weeks for your request to become effective. If, due to human error, you continue to receive unwanted communications, please contact us again and we will make every effort to correct the situation. When you provide us your email address, we may send you emails necessary to process your order, respond to a request, provide customer service, or promote products or services. For example, after you place an order with any online catalog, you will receive an email confirmation and, in most cases, an email with package tracking information. Recipients of our email gift cards will receive an email notifying them of the gift and instructing them how to redeem it. When you make a purchase, request a catalog or create an account on our Web site, your transactional information is transmitted in a safe, encrypted format.